Residential - Single Family - Sugarloaf Key, FL This 4,000 sq. ft. custom built concrete 5 BR 3.5 BA Pool home sprawls over 1/2 acre point lot & is highlighted by gorgeous sunset views over Sugarloaf Sound. 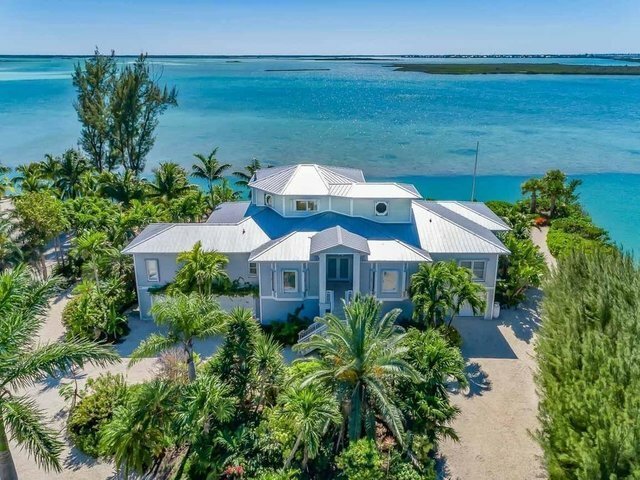 As you enter through the Foyer to the large Great Room beautiful Brazilian hardwood floors & soaring ceilings greet you along w/lots of glass looking out to the open water. The Chef's Kitchen offers granite counters, lots of cabinetry & breakfast nook w/wide water views. The Master Suite is complete with large bath, his/her walk-in closets & picturesque views of the bay. The 2nd story Family Room is ideal for entertaining friends & family. Guests are accommodated in the Guest Wing w/2 large Suites. The tropically landscaped grounds boasts a sparkling waterfront pool & concrete dock w/davits. 5- car Garage & metal roof & storage.